The Crips are a predominantly African American gang that originated sometime between the mid-1960s and 1971 in South Central Los Angeles, California. The origin of the Crips is highly mythologized and facts are difficult to separate from myth. One of the most common versions involves Raymond Lee Washington of the East Side Crips and Stanley Tookie Williams of the West Side Crips uniting their two gangs to form a political organization that would combat gang violence. While the early group was inspired by the Black Panthers mission to give communities control over their neighborhoods, the Crips later evolved into a violent street gang. In his autobiography, Stanley Williams claimed that he and Washington founded the gang in 1971 with noble intentions — without any influence from the Black Panthers — to provide protection from street violence, but eventually steered the gang toward violence. Alternatively, the United States Department of Justice and some social scholars claim that Raymond Washington solely founded the gang in the mid-1960s to imitate the Black Panther Party and older Los Angeles gangs. It is universally agreed upon, however, that most of the members in the gang’s early years, including its two supposed founders, were less than 18 years of age. By 1972, the Crips were identified by the Los Angeles Police Department as an increasingly violent and dangerous syndicate composed of at least six loosely organized gangs or “sets.” The number of sets increased to 45 by 1978 and continued to expand at an even more rapid rate, when the gang began to produce and distribute phencyclidine (PCP). 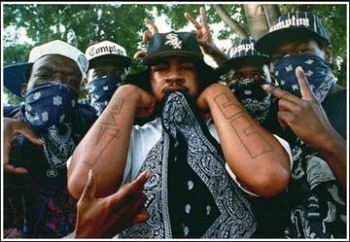 Supposedly, one consequence of the Crips’ aggressive expansion was the unification of smaller rivals into the infamous Bloods gang. The Bloods-Crips rivalry has become so heated that it has even become widely featured in movies, rap songs, and television. In the early 1980s Crips sets began to distribute crack cocaine. The huge profits from this drug’s distribution allowed the gang to expand to new markets in other Californian cities and eventually to other states. The gang continued to grow in the 1990s and today they are one of the largest street gangs in the country. Although it is difficult to estimate the exact number Crips in the country because of their loose organization, United States Department of Justice claims there are currently upwards of 35,000 members divided between 800 sets in 48 states. Mike Davis, City of Quartz: Excavating the Future in Los Angeles (New York: The Alpine Press Inc, 1991); Stanley Tookie Williams, Blue Rage, Black Redemption: A Memoire (New York: Touchstone, 2004).